At Optimum Security, our Nanaimo security team offers a wide range of options to help businesses and homeowners to gain the sense of peace of mind they are looking for. 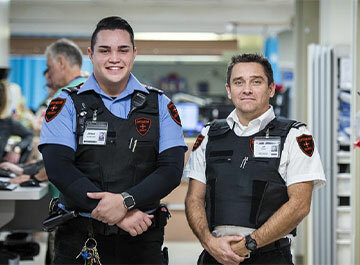 Our Nanaimo security guards are well trained, professional, and dedicated to helping to provide the highest quality of care for each of your needs. We offer security guards, mobile patrol services, as well as security alarms and systems. The security guards available to residents and commercial organisations in Nanaimo are top-notch when you turn to Optimum Security for your needs. Our first and primary goal is to provide you with support. We patrol and monitor property, assets, and people to ensure comprehensive protection. Because our guards are so visible, it is less likely that problems will occur. Yet, if we observe illegal or inappropriate, we will take necessary steps to manage it. Our security guards work closely with our Nanaimo clients to ensure the very best protection possible. They watch alarm systems in place including using video cams and other systems. Because our team is always available, they can react quickly and provide better long-term outcome. In addition to our security guards and mobile patrols in Nanaimo, we also offer systems to detect threats including smoke, fire, carbon monoxide, flooding, water damage, and more. Our systems can offer two-way communication, giving you the ability to call out for assistance. With our uniformed security guards present on your site, home or business, you can count on having access to exceptional care. We encourage you to contact our Nanaimo security services today to learn more about how we can offer you the protection and guidance that you need. Contact Optimum Security for a customized quote.